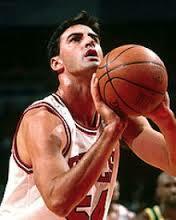 Home Tags Posts tagged with "jack haley"
Former NBA player Jack Haley has died at the age of 51. Jack Haley’s family confirmed his death, saying the cause was heart disease. The sportsman died on March 16 at Los Alamitos Medical Center, according to the Orange County coroner’s office website. There were no indications of foul play and an autopsy will be performed, the coroner said. Jack Haley played for Chicago Bulls, New Jersey Nets, Los Angeles Lakers and San Antonio Spurs during his career, when he averaged 3.5 points and 2.7 rebounds mostly as a reserve. He sat out the entire 1992-1993 season because of injury. The Bulls drafted the 6-foot-10 forward-center as the 97th pick overall in 1987 out of UCLA, where he played three seasons and helped the Bruins with the NIT championship in 1985. He graduated from Huntington Beach High and spent one season at Golden West College before transferring to UCLA. He played in Spain before joining the Bulls. Jack Haley had two different stints with the Bulls, starting his career with them and then returning to the team in 1995-1996. He appeared in only the final game of the regular season, scoring five points in seven minutes. He didn’t make the playoff roster, and the Michael Jordan-led Bulls set a record for victories in a season, going 72-10 on their way to winning the NBA title. He was known on that team for his friendship with Bulls star Dennis Rodman, and he bristled at suggestions that he primarily served as a baby sitter for the eccentric rebounder. Jack Haley later worked as a broadcaster on Lakers telecasts. He lived in the Orange County city of Seal Beach. He appeared in the movies Eddie and Rebound, and was in Aerosmith’s music video Love in an Elevator. Jack Haley is survived by his sons Jack Jr. and Jeff, his mother Jeanette, brother Tim, sister Sondra and ex-wife Stacey.